Why Doesn't Malware Appear in the Add/Remove Programs List? - Ask Leo! I have a page that somehow embedded itself with a corrupt software program that I downloaded from an American university. I understand that this thing is a parasitic browser that provides a route to viral contamination. With the help of Norton, I eventually managed to remove it. Why is there no indication in the Control Panel for removal? Using “search” brought out the offending program, but it did not allow me to delete it. What advice can you give for tracking an unwanted and intrusive browser? The normal Norton 360 failed to protect my laptop, but thanks to one of their online agents, after an exhaustive analysis of the registry, it was removed with a more powerful scan made available by them. What you’re dealing with is a form of malware. It may not be the malware per se; meaning that it’s not doing anything specifically bad itself, but it’s a vector for malware. It installs itself on your machine, so malware can download without your permission or interaction. I’ll talk about the malware in a moment. First, let’s talk about the Add/Remove Programs list. Windows doesn’t generate the entries that show up in the Add/Remove Programs list in the Control Panel. Windows supplies some functionality for it, but it’s the setup program for the software that generates that entry when it’s installed. Legitimate, non-malicious software wants you to recognize that it’s installed, so you can change your configuration or uninstall the software, if necessary. Now, think for a moment about what malware wants to do: It wants to do its malicious work without you ever noticing. As a result malware does everything that it can to hide. Making itself obvious in any way (like putting itself on the Add/Remove Programs list) is counter-productive to everything that malware wants to do. I’ve said it before, but not all anti-malware tools can actually stop all malware. Malware is being generated at too rapid a rate. There are too many different detection techniques to both find and create malware for there to be a truly perfect detection solution. As a result, a good anti-malware program, like Norton (or some of the others that I recommend), will catch most malware, but it doesn’t mean it will catch every piece of malware. Remember to keep your anti-malware tools up-to-date. That increases the odds in your favor although things still slip through. That’s what I think has gone on here. Just remember: malware never wants to be obvious. 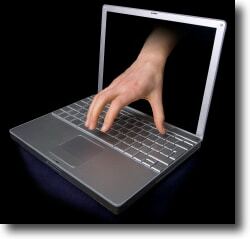 « Previous post: Can Backups of Email Be Hacked? What is an “unwanted and intrusive browser?” Browsers are fairly hefty pieces of software. How does one install a browser by accident? What I think that person probably meant was browser toolbar of add-in. How can I get rid of Ask, in all it’s forms, once and for all? I’ve used Adaware successfully to remove it. Sometimes you have to manually reset your home page and default serch engine aftr that.